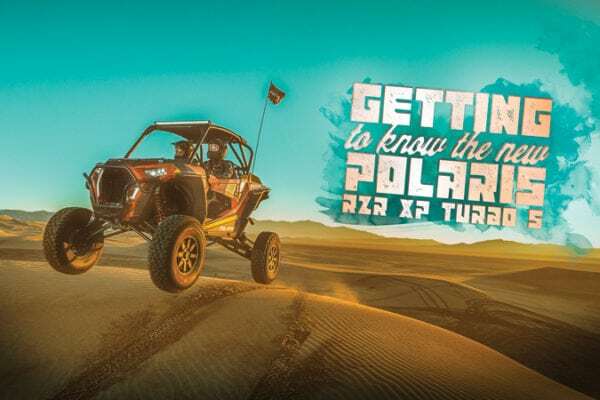 Polaris has answered back, with the completely redesigned, 72” wide RZR XP Turbo S. For the past few years, the performance UTV market has been a literal “one-up fest” between Polaris and Can-Am. 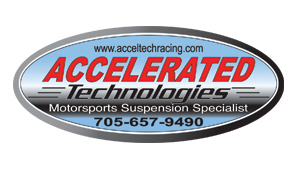 One manufacturer dropping a new machine, and the other coming right back with a few more HP, inches of travel, or both. 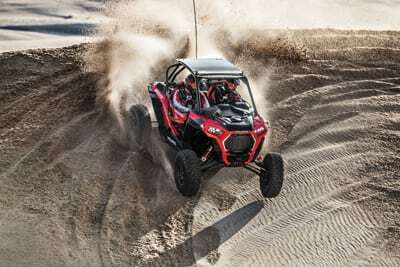 While they have both been extremely busy updating and marketing these extremely capable machines, Can-Am took a big leap ahead with the completely new Maverick X3. 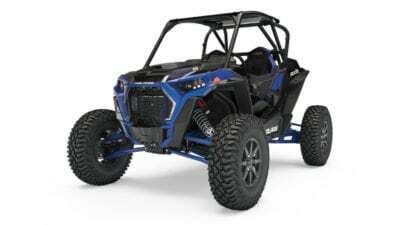 A whole new chassis with longer wheelbase, power plant, and suspension platform, and even more impressive was the Maverick X3 X RS Turbo R with a 72” wide desert and dune ready, long travel platform. Polaris enthusiasts have been patient long enough, and have been waiting two years for an answer to the X3, and are hoping it’s finally here. The X3 has been selling like crazy all over the world, and the higher priced, 72” wide X3 X RS has become extremely popular, anywhere with more open desert or dune riding. Everyone has been expecting or speculating about a completely new machine from Polaris, but at first glance the RZR XP Turbo S looks kind of like they just slapped a set of wider, long travel suspension on the Dynamic model; or did they? At first glance the new RZR S looks pretty similar to the previous model, and indeed it does share the same power plant, and similar chassis. The wheelbase is also the same, as are the seats. With that said, the RZR XP Turbo S is way more than just a wider, long travel Dynamic Turbo RZR. The new XP Turbo S is a race width, long travel Turbo RZR platform with 32 inch tires, a great new dash and a ton of other upgrades to durability. The XP Turbo S gets a-arms that are not only 4 inches wider per side, but also extremely stronger than the previous 64” model. The top a-arms use thicker material with a bunch of additional plate gusseting around the shock mount. The lower arms are made out of extra thick material and are arched for maximum ground clearance. Polaris has been torture testing and developing this new suspension platform for years, and claims that it’s the real deal, and it sure looks like it! The computer controlled, FOX IBP shocks are actually the same length as the ones found on the Dynamix model. The key difference being that the rear shock body diameter has been increased from 2.5” to the full 3 inch diameter that you find on most full race UTV applications. The front is still 2.5”, but this is pretty standard for fronts, even on the full racecar set-ups. The shocks are set up to provide 19” and 21” of travel, but the suspension design still leaves the Turbo S skid plate with 4-6” of ground clearance at full bottom. This is where Polaris gets the “usable travel” spec # of 24.8” front and rear. One of the coolest things about this car is the stock equipped 32” tires, and its 15” wheels. Taller tires create more ground clearance as well as smoothing out the ride with the increased roll out. In the desert, the 32” tire is definitely the crowd favorite, but on any other car, this requires new clutching, and often, even wider suspension for inner fender clearance. The Turbo S comes off the showroom floor with the tires you want, and already clutched and calibrated perfectly for them. These tires help create the class leading 16” of ground clearance, as well as increasing bottom out clearance when relating to usable suspension travel versus the skid plate dragging. The 15 inch wheels look good, but more importantly, they are actually the same 2” offset wheels on both the front and rear of the machine. This is big news, as most aftermarket tire set-ups will always go this way, with equal width tires on all four corners. The difference is that the rear trailing arms are set up to keep the rear of the car equally as wide as the front with the same wheels. Almost every other performance UTV has used a wide, offset rear wheel in stock form, which will leave the rear of the UTV 2” narrower than the front when installing four matching wheels. This also allows for a single spare tire that will correctly fit on all four corners, should you need to use it. Speaking of spares, rumor was that only 15” wheels would fit on the RZR S. We dug a little deeper, and a 14” fits the front just fine, and the rear will just require a little clearance, or trimming of the plastic mud scraper. Polaris has recalibrated the EPS system to about 25% more assist, to make up for the larger and heavier tires. They also gave the Turbo S a new steering rack that is said to be stronger, and features larger mounts. Unfortunately, the new steering rack is said to not retrofit the older machines. The throttle mapping has also been re-calibrated to be more aggressive, yet still provide increased throttle control. The redesigned clutch box allows for better air flow and decreased belt temperature. Quite possibly biggest durability improvement on the new XP Turbo S is the “Isolated Front Differential”. The “weak” front differential is a known problem child among both racers and enthusiasts. Polaris recently released the race ready RS1 single seater with a much larger, heavier duty front diff that features rubber mounts to isolate it from shock, noise and driveline abuse. The unit is said to carry three times the impact resistance to shock, and also quiets the drivetrain chatter drastically. The larger, rubber mount differential has proven itself as incredibly tough in the RS1, and will undoubtedly be an improvement in the Turbo S.
Will this differential be an upgrade option for previous XP Turbo’s? Yes and no! It looks like it could definitely be done, but it is much larger, and will require a substantial amount of trimming and fabbing of mounts. The axles are obviously new and longer, but not quite the full 4” wider, as the differential is so much bigger. The axles look to be about the same diameter, but Polaris claims to have massaged the internal CVs to improve CV angle, add strength and reduce heat. The ROPS cage has also been restyled with what they call a low profile, “Predatory look”. The new cage is reinforced, and they have added two additional down-tubes that connect to the chassis near the rear of the fenders. The new ROPS cage also includes a great looking, factory supplied aluminum roof. While this cage looks to be stronger than previous models, it is still made from the same lightweight steel tubing, and we expect to see racers replace it. The Turbo S features the trickest, most-evolved RZR cockpit we’ve ever seen. It’s been developed for an improved driving position, and features really nice, retractable four-point harnesses for safety and comfort. It also gets a D-shaped SPARCO steering wheel. The new instrument cluster and the seven-inch ride command display finishes off the dash. The new instrument cluster features dual analog gauges for easy monitoring of both speed and RPM. It is not only much easier to read at speed, but also really looks a whole lot better than the age-old plastic speedo in the older RZR. The center glove box is still there, but they have axed the see-through smart phone door, as you will now be blue-toothing to the Ride Command unit. We don’t have a ton of time in it yet, so time will tell the tale on the durability improvements. 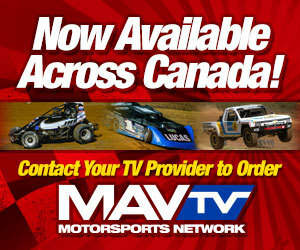 What we can speak to is the handling, comfort, and overall drivability. First, when getting into the car, the seats are the same, but the harnesses are a really nice improvement. It does take a little patience to adjust them to your size, but once you figure out the method, it’s pretty easy. 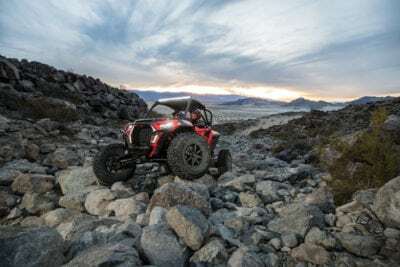 As you can tell from the laundry list of improvements, the RZR XP Turbo S is a whole lot more than just a Dynamic with a 4” wider suspension kit. This is also immediately noticeable the first time you drive it. Right out of the gate, and before we even got into the rougher terrain, we noticed how much smoother the drivetrain is. It’s way quieter, and you don’t feel it in your feet or the steering wheel. The bigger tires and where they are going is also much more visible with the wider set up. You can see the tire much better while driving, but it will also throw that much more roost your direction, without extended fender flares. 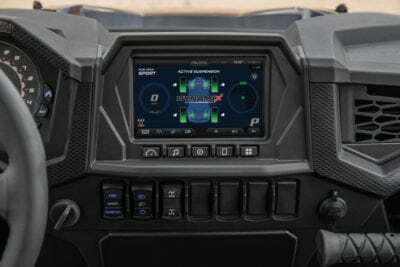 The factory optimized clutching, EPS settings, and throttle mapping are where the car really shines over any other UTV, with a long travel kit added to it. Even with 32” tires, it never feels sluggish, power is always on tap, and it’s comfortable to maneuver through obstacles. The first turn is an eye opener as well. The extra width adds a lot of stability, but also loosens up the car a little as well. We felt it was a little skatie in hardpack turns, but the increased stability still makes it an improvement. In quicker, more aggressive driving situations, you will love that they kept the shorter wheelbase, but in a sand wash or really high speed stuff, it would have been nice to see a 6-10” wheelbase increase. When you get into the rough stuff is when you really begin to appreciate the extra wheel travel. As you push the machine, you will come into stuff that you think is going to either violently bottom the shocks, or the bottom of the car, and it does neither. 16” of ground clearance is a lot more than any of us are really used to, and the longer travel suspension truly soaks up anything you throw its way. Whoops and square edged bumps are this buggy’s forte, and it definitely eats them better than any previous RZR, including the ones we’ve built with aftermarket suspension. The one and only downfall is again, the shorter wheelbase in the higher speed whoops, where it feels a little more active than a 9” longer X3, or a four seater chassis. This is a very minor complaint, and the combination of bigger tires and great, long travel suspension on a stock machine will make you quickly forget about it. Overall comfort is also greatly improved with bigger tires and longer travel. You can literally hammer rough terrain for hours, and you don’t feel the same amount of abuse that you would in a standard RZR XP chassis. This is a bigger deal than most realize, as it just makes for a more enjoyable day. This is a great machine that will undoubtedly sell well. Probably a near perfect machine for the dunes, desert, or even the racetrack. It appears to be a whole lot more durable than previous generations, but time will truly tell. Polaris definitely has an answer to the X3 with this re-design, and we can only imagine what lies ahead if the rumors of a completely new machine are true.